When we arrived to Denver we did not know quite what to expect. We ended up only spending a morning around Denver because there were so many more interesting things to see in the outlying areas. We did find some incredibly neat places in Denver while we were in town. One of our favorite places we walked blocks to get to was Union Station. 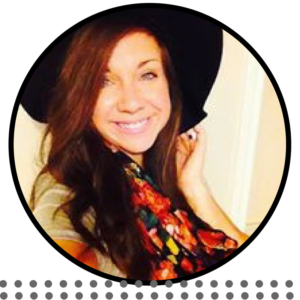 It is a continually working Train Station that is full of little restaurants, bars, and our favorite, ice cream shops. The moment you step in you feel like you have stepped back into time and you feel as if you should be wearing a cute little hat, gloves, all the while carrying a vintage suitcase in your hand. We ventured to the MilkBox creamery where I, without skipping a beat, ordered Cinnamon toast Crunch icecream, and yes it had little pieces of Cinnamon Toast Crunch in it…yum. 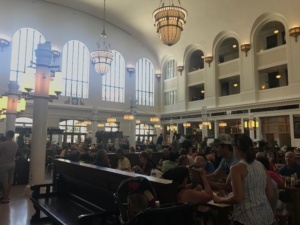 They also served spiked milkshakes if you needed an extra little something something… We fell in love with Union Station. 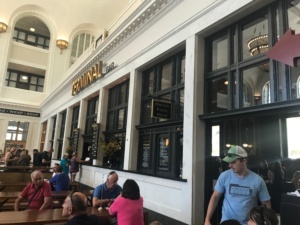 We also learned that if you take the train from the airport to Denver you will get dropped off at Union Station and it is only around 9 dollars. 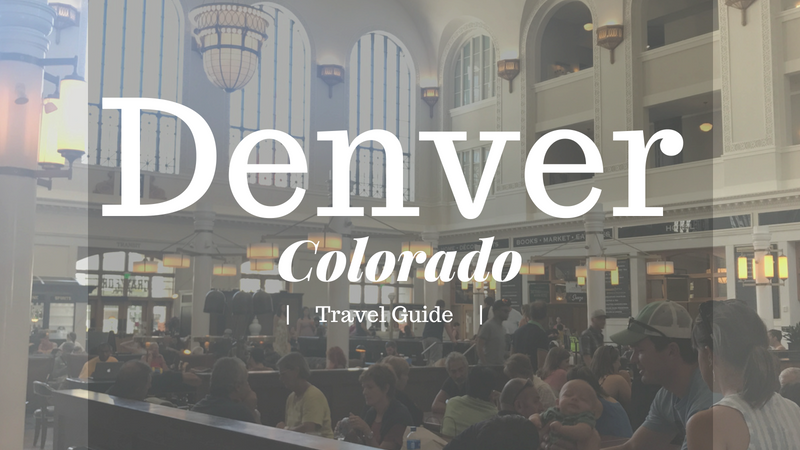 We opted against it because we knew most of the places we wanted to see we had to drive too, but it is a budget friendly choice if you want to stay close to Denver. 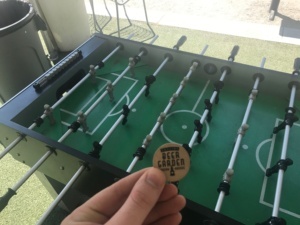 Another neat place we stumbled upon was a Beer Garden downtown, drinks were buy one get one free, there were endless lawn games, and it was all shaded….spirit fingers! 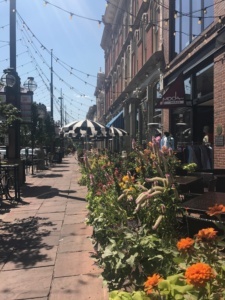 Many people had recommended to us Larimer Square which was really cute, but the shops were way beyond any price tag we would buy. We decided to check out The Source as well which was such a cute concept. Inside there was a butcher, florist, small brewery, taco shop, and a fancy restaurant. Also, while we were there a hotel was being built right next door so soon you can have all of that at the tip of your fingertips. Very similar, but offered many more restaurants, was Avanti. Avanti was the happening place of Denver, when we walked in the door there were people on every square inch, no room for movement. I would recommend not going on a weeknight! There are also multiple breweries in and around Denver, like a TON, we did not get a chance to go to any this trip, but next trip it is a priority. On another note, I am a weirdo. I dont usually eat a big breakfast….except when I am on vacation then I splurge on all the good breakfast restaurants. 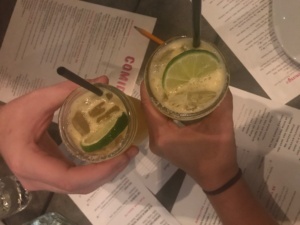 We tried a couple in Denver. Voodoo Donuts- They have every donut you could possibly think of. As you walk in, there is a display case swirling around hundreds of calories of delicious goodness. I caved and got a donut that made you feel like you had cavities just looking at it….the cocoa puff donut. It was so incredibly sweet I think it satisfied every one of my sweet teeth and more. Every donut we got was delicious! 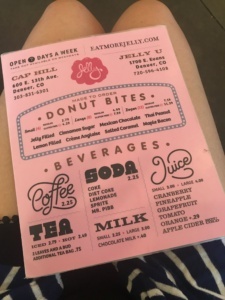 Jelly- A cute little cafe with an eclectic feel. 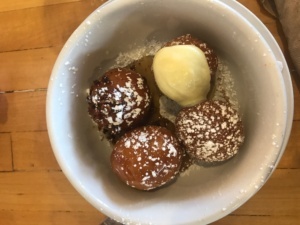 Our favorite here were the cute little donut holes you could get, we tried 5 of them and our favorite was the Cinnamon Sugar. I was not much about their biscuits and gravy, but everything else was good! Snooze is another great breakfast option that is inside Union Station. Overall I would plan your trip to Denver with other small places to visit as well because we got through Denver pretty quick. 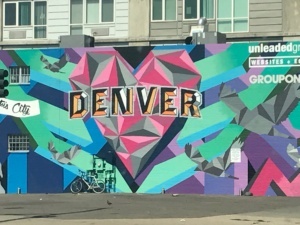 Some other things you can do in Denver that we didn’t is go to a Baseball game at Coors Field, see the Broncos play, or travel around to many of the Craft Breweries. I agreed your points. Thanks for your valuable information. You may try LAdventure Tour which is provide personalized luxury tours of Hollywood, Beverly Hills, Santa Monica, Malibu and Downtown Los Angeles.